You are currently browsing the tag archive for the ‘torment’ tag. This blog traditionally presents a beautiful crucifixion painting for Good Friday. This year’s selection comes from a somewhat different artistic tradition than the paintings of previous years. This is Andreas Pavias’s Icon of the Crucifixion, a Greek icon painted in the style of Byzantine art. The beautiful and troubling image was created at the end of the 15th century, in the years following the fall of Constantinople. After more than a thousand years, the Byzantine Empire had finally died, yet for a while longer, in Greece and in the Slavic near east, the Byzantine artistic tradition lived on and had a final glorious flowering. This crucifixion is not about realism in the same way as works by Durer and Mantegna (who were painting at the same time). The action takes place in an otherworldly golden space filled with stylized angels. The Romans soldiers have been replaced by Turks. The holy family and the saints and disciples are all dressed as Byzantine nobles. Each group of figures enacts a drama from the passion: yet the action has the stylistic quality of an elaborate didactic illustration (or even a modern pictographic work of media—like a video game) rather than the sumptuous realism of Renaissance Italy. Yet the work is no less magnificent because of this quality. Indeed the seething angular forms give it an alien intensity well suited to the subject. Cast your eyes around the icon and take in the details! The sun and moon have shrunk to little gold faces the same size as the countenances of the angels which fill the sky. Turkish executioners are breaking the legs of the two robbers to either side of Jesus—an act of “mercy” which allowed the brigands to die more swiftly. Yet Christ continues to suffer on, nailed to the monumental jet black cross dripping with blood. On the left, little resurrected figures awaken from Golgotha to eternal life. On the right, the profane throw dice for Jesus’ divine raiment. Between them, a fissure opens up at the foot of the cross. It snakes down into the black depths of hell where writhing demons wait. 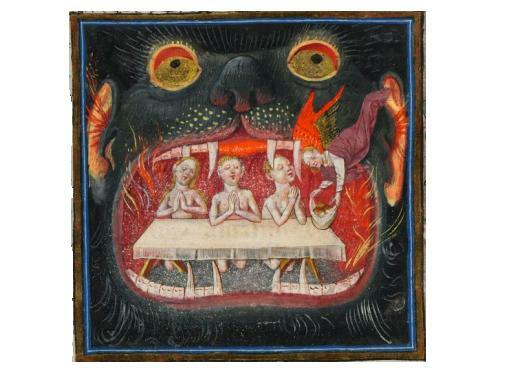 In medieval art, hell was frequently portrayed as the flaming gullet of a terrible monster. 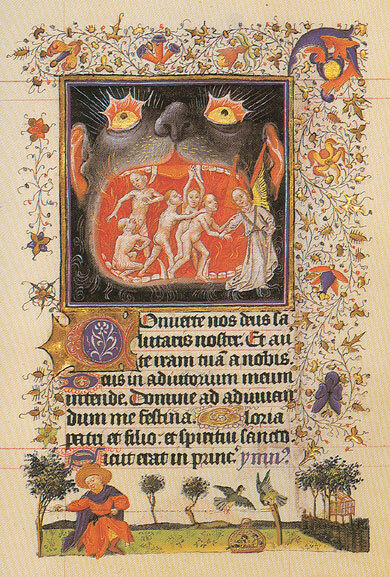 This image of the literal mouth of hell never exactly appears as such in the bible and it has been speculated that the iconography derives from pre-Christian pagan mythology. Perhaps the poisonous all-devouring maw of the Fenris wolf was transformed into the flames of damnation due to the words of early Christian proselytizers (who sometimes incorporated pre-existing ideas into their teachings). 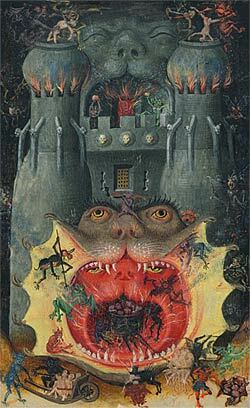 Since the imagery originated in England first before becoming standard throughout Western Europe, it has been posited that the hellmouth concept originated in the Danelaw—the Norse settlements of England. 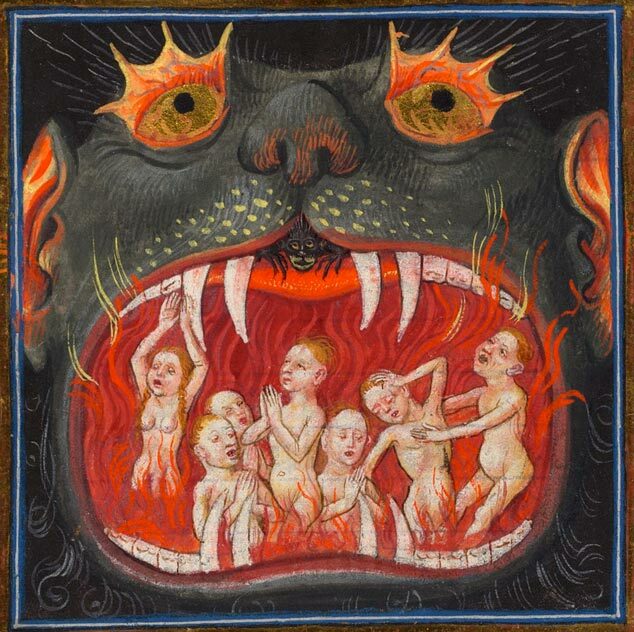 Whatever its origin, the picture of tiny naked sinners imprisoned and tormented inside of a huge merciless hellmouth is one of the most vivid images from gothic art. The images which I have embedded in this blog post all came from a single book of hours which was created in Utrecht, around 1440. The prayer book was once a treasured possession of Catherine of Cleves, who was the wife of Henry, Duke of Guise. The Duke, a powerful and important nobleman was assassinated on the orders of Henry III during the War of the Three Henrys. Catherine never forgave the French monarch and it is believed her support was instrumental to the king’s own death at the hands of a crazed assassin-monk. It is interesting to imagine her eyes running over the burning sinners as she plotted the death of kings and fed fuel into the fires of the religious wars of France. The book was divided up in the nineteenth century, but, through good fortune (and thanks to large sums of money trading hands) it is now completely in the possession of the Morgan Library and Museum. Going to the fine online site allows one to examine the book in great detail and gain many insights into day-to-day life in the fifteenth century (and get a taste of the larger zeitgeist).